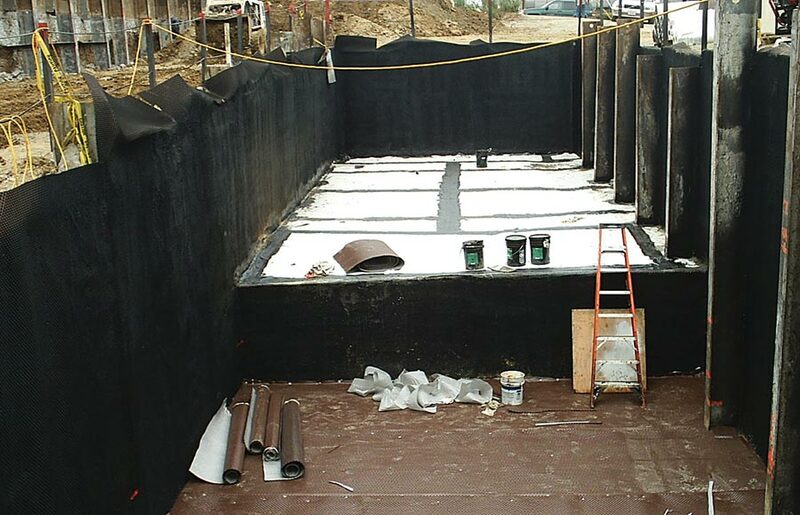 Getting a waterproofing and drainage layer tough enough to stand up to shotcrete is a top priority—because repairing the membrane after the fact is usually not an option. Shotcrete, a method of applying concrete by shooting it out of a nozzle at high pressures, has now been in use for exactly 100 years. In the western United States, shotcrete is a popular choice for creating structural concrete walls in tunnels, retention ponds, deep foundations, and other blindside work. It’s also used to remediate failed concrete and masonry and even create structures such as water tanks. Using shotcrete for constructing property line below-grade structural walls has become more common over the last ten years. 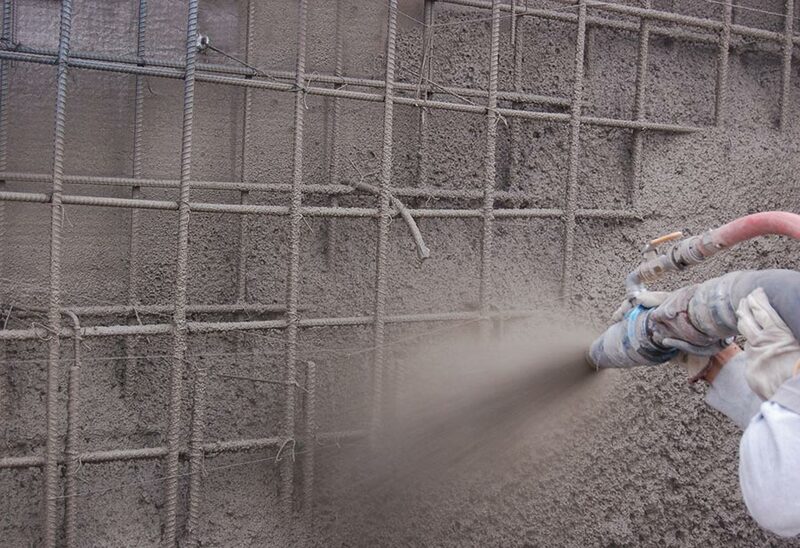 Shotcrete can be applied “wet,” that is, premixed in a hopper before being fed into the gun; or “dry,” where the cement-sand powder is mixed with water as it is propelled out the nozzle. Either way, shotcrete is typically cheaper, faster, and stronger than a comparable sized cast-in-place concrete project. With either method, the concrete leaving the nozzle is pressurized to between 90 and 100 psi, so getting a waterproofing and drainage layer tough enough to stand up to the force of the shotcrete application is a major problem. But dependable waterproofing is usually essential. It’s especially critical in blindside work because repairing the membrane after the fact is usually not an option. Because of its unique composition, shotcrete is especially prone to shrinkage cracks. 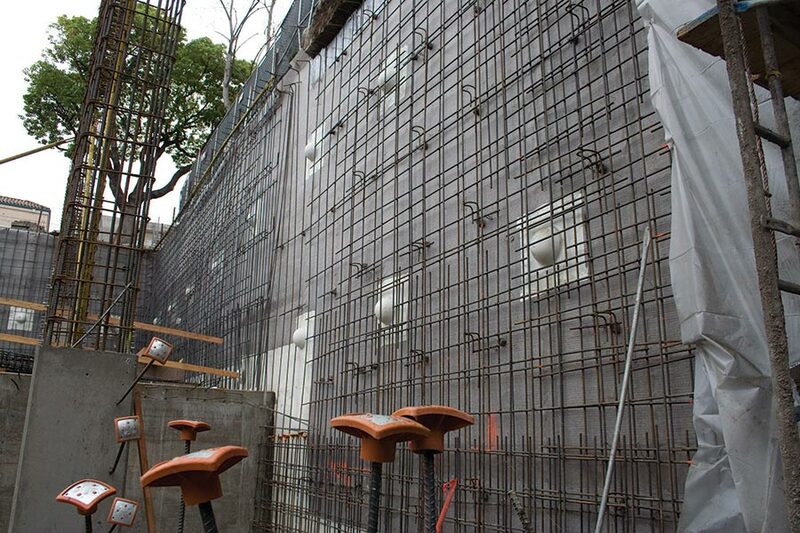 Poor workmanship can create issues, such as voids between the shotcrete and the waterproofing membrane, or “shadow voids” behind steel reinforcement. Improperly mixed and/or porous shotcrete can also be a problem. However, a number of manu-facturers have developed waterproofing solutions that can handle the unique challenges specific to shotcrete. The most straightforward solution is to use a spray-applied coating or sheet good that’s tough enough to stand up to the application. 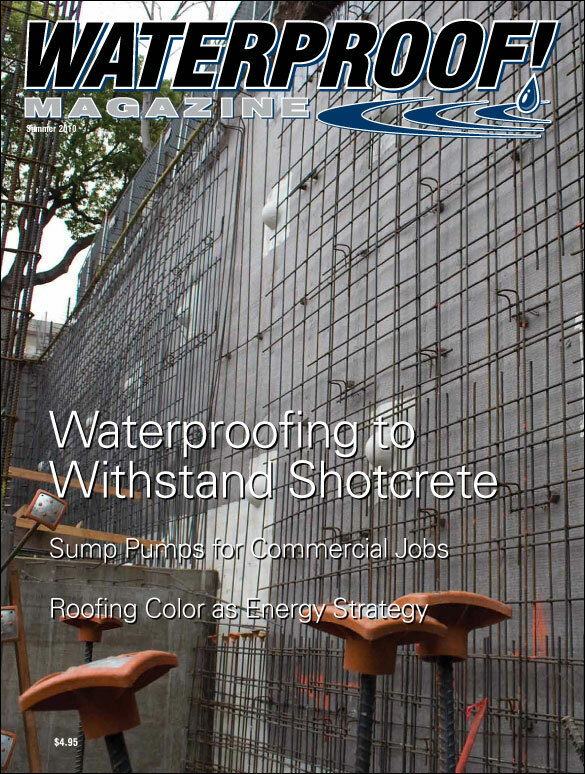 Dave Polk, owner of Epro Waterproofing Systems, encounters shotcrete often in blindside work, and says that a critical first step is to determine the type of soil retention that will be used. “There are four or five options on the type of soil retention system,” he says. These include soldier piles and lagging, probably the most common system. Other methods include soil nails, designed soil mixes, shotcrete soil stabilization and sheet piles. “Very rarely do you get conditions where you don’t have to put some kind of soil retention system in place,” he says. Polk bases his system around an extremely tough high-density polyethylene (HDPE) dimple sheet drain. First, the drainage layer is installed and fastened to the soil retention system. Polk says the overlap varies based on whether the backing is wood lagging or sheet piles. Once the drainage layer is installed and detailed, they spray on the waterproofing coating. “This has two purposes,” Polk continues. 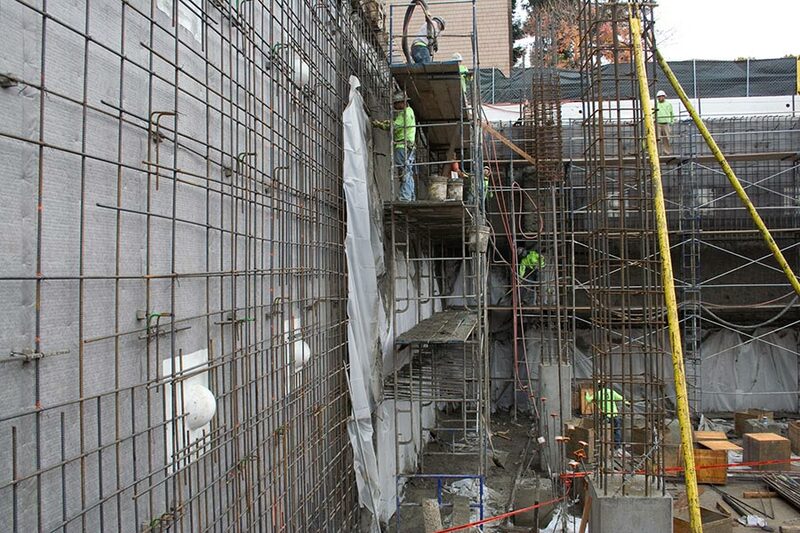 “In addition to waterproofing the wall, it creates a better bond to the shotcrete.” Epro has conducted pull-off tests that reveal it takes between 42-50 pounds to separate the membrane from the cured shotcrete. 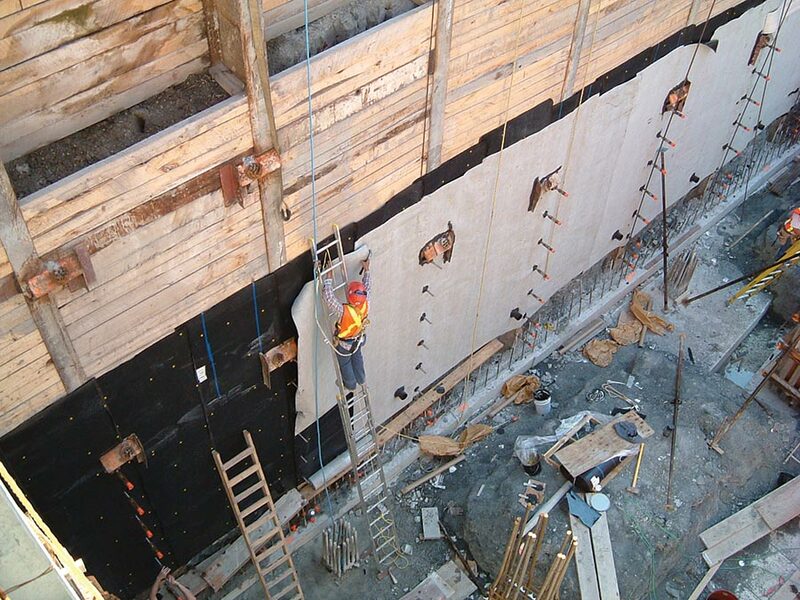 A second option for waterproofing behind shotcrete is to use a self-healing bentonite membrane. Usually made from bentonite granules sandwiched between two geotextile sheets, this type of product stands up well to the rigors of shotcrete application. 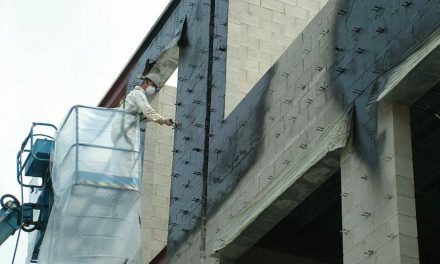 Paraseal LG, made by Tremco Commercial Sealants & Waterproofing, is another such option. It consists of a self-sealing, expandable layer of granular bentonite laminated to an impermeable, high density polyethylene (HDPE) sheet. The two-component system forms a tough, high performance membrane specifically designed for blindside applications. Applied with the bentonite facing the lagging wall, the HDPE is tough enough to withstand shotcrete applied directly to the face of the membrane. Regardless of the membrane, however, proper preparation is crucial. 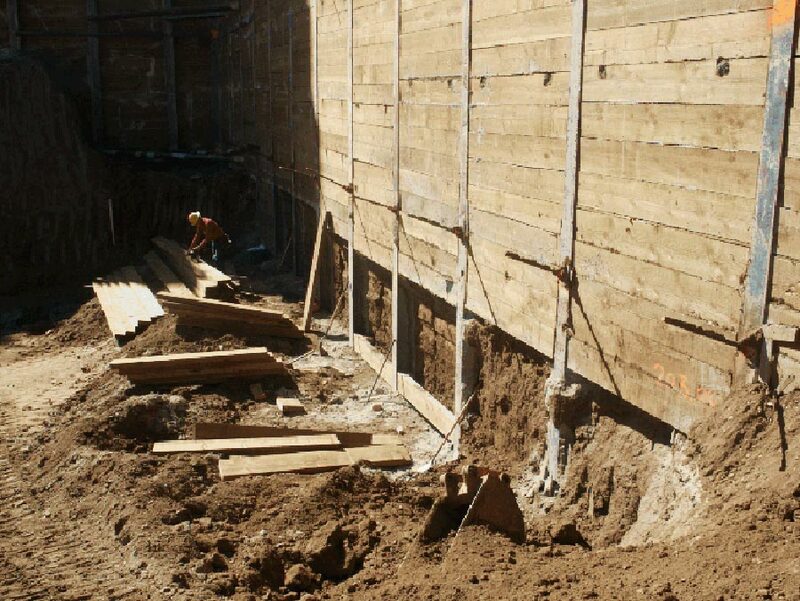 Because of the force and weight of shotcrete, the lagging or retaining wall construction must be carefully inspected and detailed to ensure it can support the membrane. The substrate must be solid, tight, and extend all the way to the bottom of the wall. Gaps larger than ½ inch must be filled or covered using an approved method. 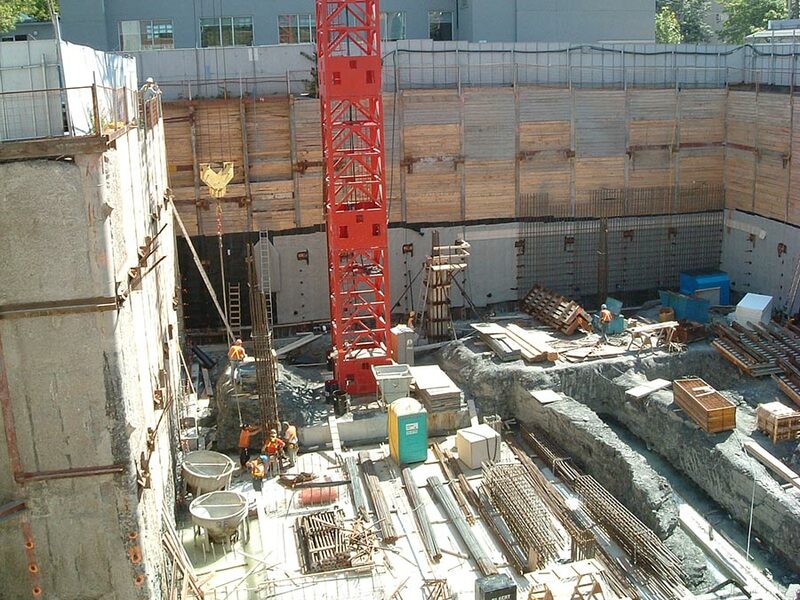 In high groundwater situations tying the vertical waterproofing in with the underslab barrier is a critical step. Larger voids can be filled with engineered soil or cementitious grout. Gaps in wood lagging are sometimes covered with plywood. Using shotcrete to create structural walls requires a skilled nozzleman that knows how to ensure good consolidation and prevent voids. Because this is not always the case, Grace Construction Products partnered with DeNeef Construction Chemicals to introduce a shotcrete waterproofing system that can handle some of the problems created by sub-par shotcrete. 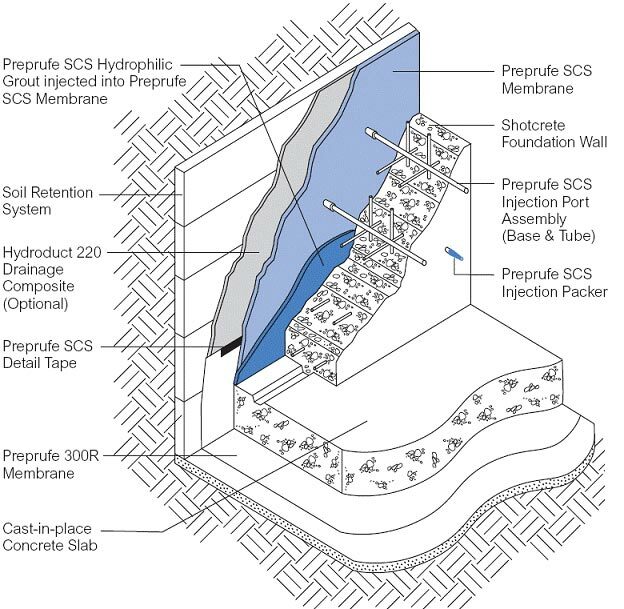 Called Preprufe SCS (for ShotCrete System), it allows for an expanding hydrophilic grout to be injected behind the wall after concrete placement. Preprufe SCS from Grace Construction Products uses pre-applied injection ports to ensure any voids behind the wall are filled. In this photo, they’re the white domes visible behind the rebar. 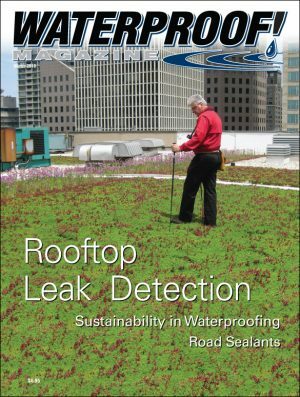 “The challenge with this approach is that, until the repair is completed successfully, there is a risk of continual water damage, downtime of the structure, liability concerns, and other costly consequences,” he continues. 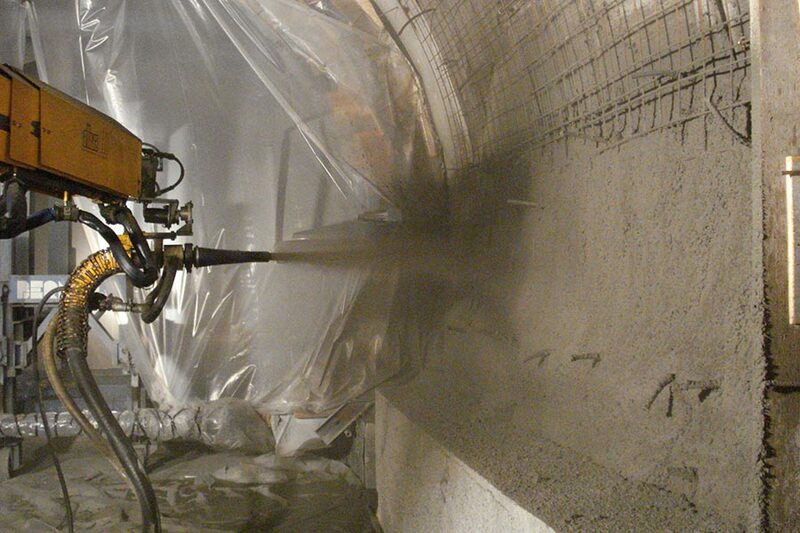 Once the waterproofing is in place, shotcrete is sprayed at pressures reaching 100 psi. 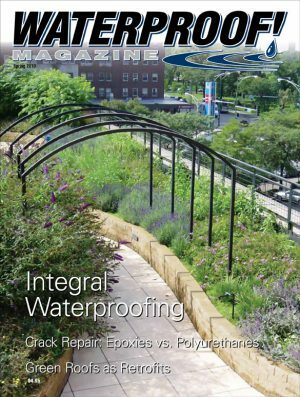 “The challenge,” he says, “was how to design and produce such a shotcrete-specific waterproofing system. After three years of development and testing, the product is now available. The system is installed in three steps. First, a sheet membrane is installed and attached to the lagging wall. It’s “designed specifically to withstand the force of shotcrete application and to control the thickness of post-injected grout.” The membrane consists of a plastic film (facing the lagging) and a nonwoven, semi-permeable geotextile (facing the shotcrete applicator). 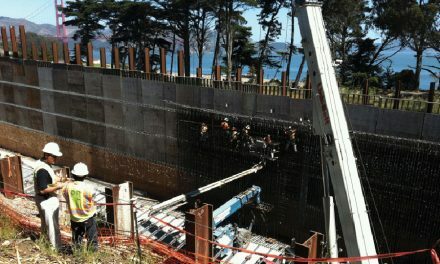 After the steel is in place, but before the shotcrete is applied, grout injection ports are installed-—usually every four feet on center—over the face of the wall. Finally, after the shotcrete has cured, a two-part hydrophilic grout is injected into the membrane through the injection ports. The grout fills the cavity created by the mesh layer in the membrane and escapes through the geotextile, filling any shotcrete voids. It also seals minor defects and cold joints, and can repair damage to the membrane caused by the installation of the reinforcing steel. 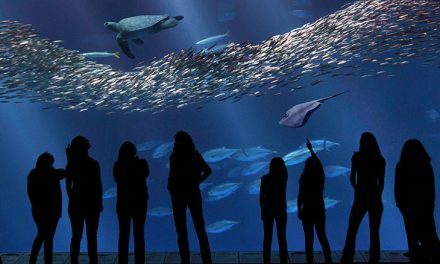 The result is a continuous waterproofing barrier, fully bonded with the shotcrete, that can withstand up to 200 ft. of hydrostatic pressure. The “envelope” between the membrane and the geotextile minimizes waste and ensures that the grout maintains a uniform thickness. Like all of the solutions mentioned so far, Preprufe SCS requires a solid backing behind the membrane. Grace specifies that the backing must be smooth, with no gaps larger than ½ inch. Otherwise, they recommend sheathing problem areas in ½-inch plywood or other facing materials approved by Grace. An easier, less labor intensive solution involves no membranes at all. 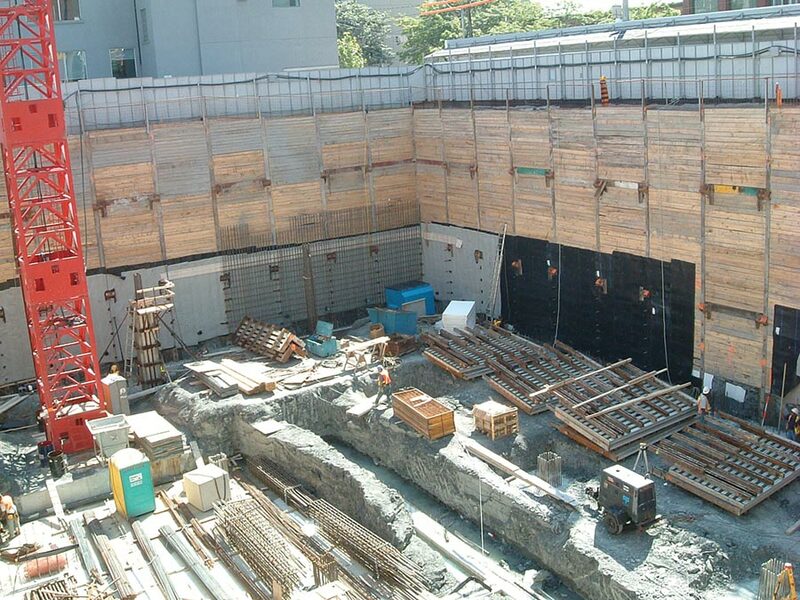 A number of integral waterproofing admixtures have been formulated that waterproof the shotcrete itself. Introduced in 2005 and abbreviated PAES, the product has already accumulated an enviable record. Tests indicate that in addition to making the concrete impervious to moisture, it also improves its adhesion and freeze/thaw resistance. How well does it resist moisture? One 2008 test involved taking two 50 gallon steel drums, drilling them full of holes, and then coating them with shotcrete. One used a regular mix design; the other used the Penetron Admix. After five days of curing, the drums were filled with water and pressurized to two bars. Fifteen days later, a visual evaluation showed that the PAES-coated drum was about 70% dry, whereas the control shotcrete was completely soaked with water. Lab tests confirm that PAES reduced water penetration from 21mm in the control concrete to 7mm. Field results are equally impressive. 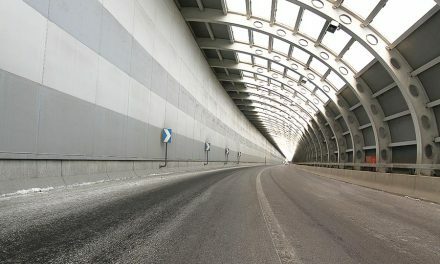 In the last few years it has been used to seal miles of aging rail tunnels in Scandinavia and Italy. It’s also being used on a massive potable water tank—70 ft. high and 140 ft. in diameter—being built using shotcrete technology in Harrisonburg, Va.
Shotcrete, already a century old, is a proven technology used around the world. 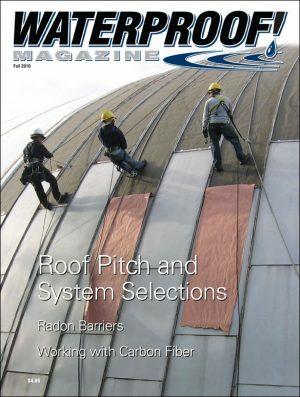 While it presents unique difficulties to the waterproofing contractor, solutions do exist. Whether it’s an established product or a newer development, plenty of options exist to ensure shotcrete walls keep moisture out. Construction of the massive below-grade portions of the project were to be created with shotcrete, and presented some significant challenges, as the site has a high water table. Additionally, the project was built directly adjacent to the existing Baltimore Convention Center, which mandated a tight excavation footprint. Brisk Waterproofing was selected to apply the 100,000 sq. ft. of below grade waterproofing membrane. “The material we used was Cetco’s Volclay Ultraseal SP,” says Kevin Chorba, a manager at the company. He says they selected the bentonite sheet material “due to its ability to withstand shotcrete without tearing or the seams pulling apart.” It was mechanically fastened to the wood lagging with washers and staples. The results were impressive. So impressive, in fact, that the general contractor passed them the change orders for waterproofing the plaza deck as well. This effectively doubled the size of the original contract.